As a working mom of 3, I have a lot going on in my life. I'm always looking for a way to keep track of everything so I don't miss any meetings, appointments, or bill payments. There are so many apps and websites to help keep you organized but I prefer the old fashioned way. I like using a planner. I like to open up my planner and see at a glance what is going on for the week and the month. I am a visual learner so I am able to memorize things better if I see it on a page. I have a lot that I need to keep track of. We pay our daycare per child, per day, so every day is different and therefore our bi-weekly payments are always different. The twins go to school in the morning 3 days a week but of course, sometimes they have days off where they are at daycare all day. I keep track of a who goes to daycare each day in a monthly view calendar so I know how much we have to pay every other week. For my day job, I have a lot of meetings and client calls that I have to attend and need to prepare for. After work, I also have work events that I have to attend. On top of my work commitments, I also need to keep track of personal events such as doctor appointments, birthday parties, and haircut appointments. 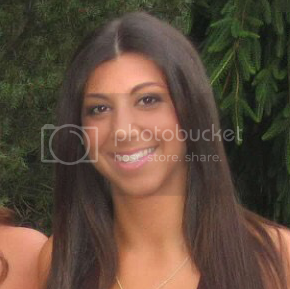 I like to view all of my work and personal commitments in a weekly view. On the left side of the page, I keep track of my appointments and on the right side of the page, I have a running to do list for my work assignments. I break every task down to its smallest element so I have more to check off on my to do list. It makes me feel more accomplished. 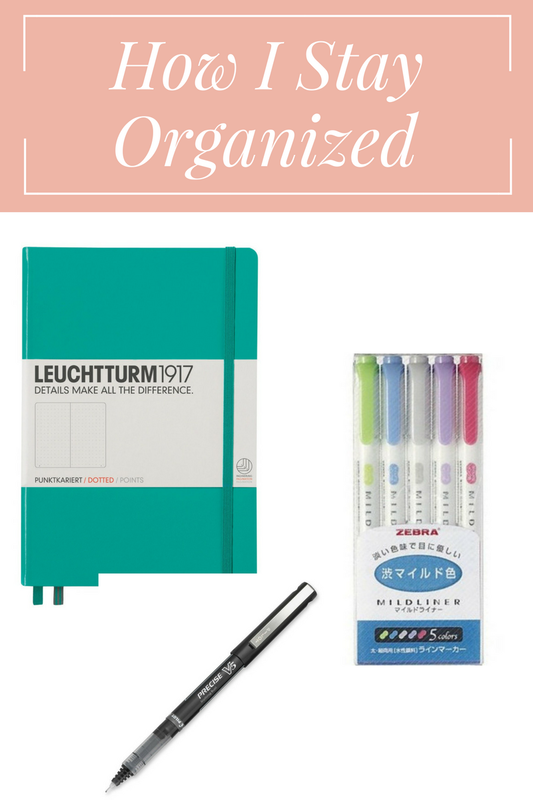 I looked all over to find a planner that would fit my needs but nothing was quite right. One night when I was up in the middle of the night feeding the baby, I discovered bullet journals. 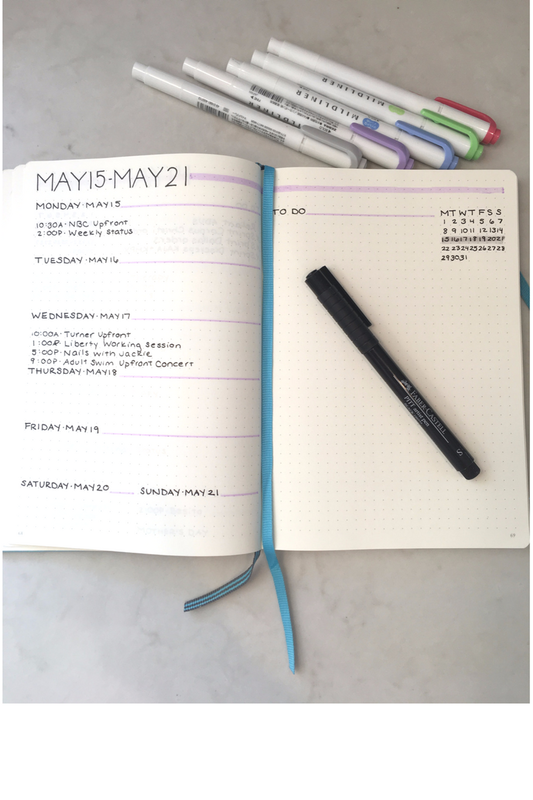 The concept of bullet journals is to create a planner that works for you. Some people use it for a calendar, a to do list, to track debt or weight loss, etc. Pretty much anything you need to keep track of. I keep it basic and create a monthly view to track my kids' daycare and a weekly view to keep track of what is going on each week. I purchased a dotted Leuchtturm 1917 notebook for my planner. I purchased the dotted version to ensure that everything would line up correctly vertically and horizontally. I go crazy for symmetry and organization. To add some color to each calendar, I use these beautiful, pastel colored midliners and use a different color for each month. I also love using Faber Castell artist pens because of the way they write, the beautiful color, and the fact that the pens don't bleed. If you think a planner would work for you, try one of these beautiful planners or make your own using a blank journal! One of the best ways to give your room a new look without spending a lot of money is giving the walls a fresh coat of paint. Choosing a paint color can cause people a lot of anxiety since the walls can be seen throughout the entire space. 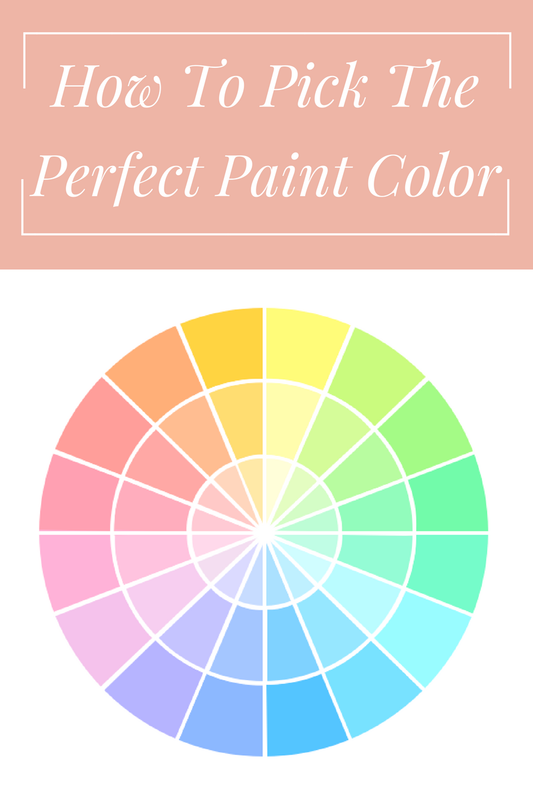 Here are 5 tips to help you pick a paint color that you will be happy with. 1. Get Inspiration - Use colors you love. You can pull a room's color palette out of a pillow, painting, or a rug. Any accessory in your home can be a starting point for your color palette. Websites such as DecorPad, Houzz, and Pintrest can also offer a ton of inspiration. 2. Look for Popular Color Combinations - There is a reason why beige and blue looks good together. They are colors that are found at the beach in the sand and the ocean. You'll find that a lot of great color combinations are found in nature. A lot of sports teams also use great color combinations. 3. Use the 60/30/10 Rule - Three isn't a crowd when it comes to choosing colors. Three is a good rule of thumb for formulating your color palette. After choosing three shades, break them down into the 60/30/10 rule for a cohesive look. 60% should be the dominant color, 30% should be the secondary color, and 10% should be an accent color. 4. Complementary Colors - Complementary colors are any two hues that sit opposite each other on the color wheel. For instance, red and green, yellow and purple and blue and orange are all complementary colors. When creating a complementary palette, look beyond the primary colors. If you are afraid of having a wall color that is too bold, try using natural shades like sage green, dark olive and mustard yellow for a sophisticated look. 5. Analogous colors - Analogous colors sit next to each other on the color wheel. Neighboring colors create a striking contrast when used side by side in an interior. If you are looking to evoke a certain mood in a room, check out the Psychology of Color chart below. Just a reminder, Mother's Day is Sunday, May 14th! It's not my first Mother's Day, but I am looking forward to spending the day with my parents, my brother, my husband, and our three kiddies. We are going to have lunch at one of my favorite restaurants and I can't wait! I am also looking forward to seeing my brother since I haven't seen him in such a long time. He only lives about an hour away but our schedules all always conflicting. My mom and I are both big John Mayer fans, so I got us tickets to see John Mayer in August. We usually get tickets for a concert or a Broadway show for Mother's Day so we can do something together. 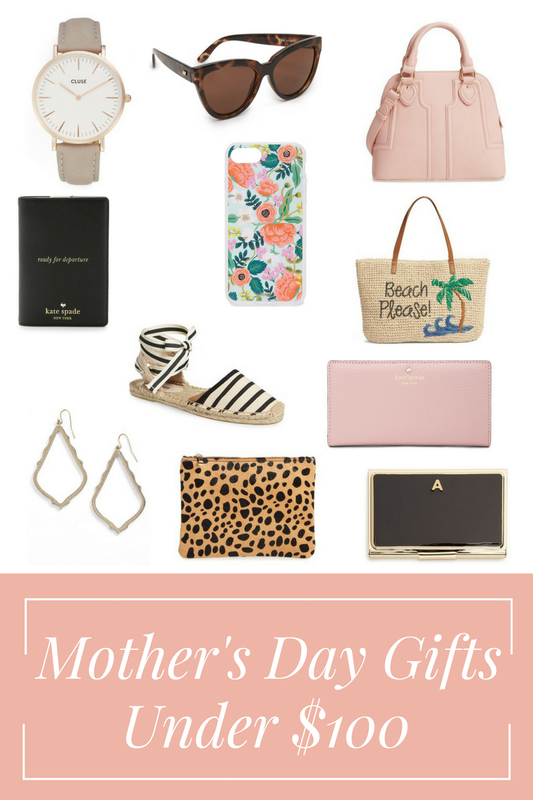 If you haven't gotten your mom a Mother's Day gift yet, I found some great gifts for your mom that are all under $100! Cluse Watch - I love the soft blush color of this watch and it's only $99! Sunglasses - Classic, tortoise shell sunglasses will look great on any mom. Sole Society Handbag - This bag looks a lot more expensive than it is. It can be carried by hand or over the shoulder and holds a lot! Kate Spade Passport Holder - If your mom loves to travel, this passport holder with a classic look would make a perfect gift. iPhone Cover - It's always fun to change your phone cover from time to time and this fun print is perfect for spring. Beach Tote - My mom loves the beach and usually gets a new tote each year. The saying is so cute and perfect for a mom that loves time in the sun. Soludos Espadrilles - I purchased these a few months ago and I think they're so cute and they're very comfortable! Since I wear a lot of navy and white in the summer, it goes with a lot of my wardrobe. Kate Spade Wallet - I own a similar Kate Spade wallet and the quality is fantastic. Plus, the bright color makes it easy to find in your bag. Earrings - I love the classic look of these earrings. Perfect for making mom feel special. Leopard Clutch - I own a similar clutch. I love how a leopard purse elevates an outfit. Business Card Holder - I need one of these. In my business, I have so many business cards and being able to keep them organized in such a beautiful case would be great for any career driven mom. Happy Mother's Day to all of the moms out there! You can shop the items in the widget below!